Associate Professor Niveen Khashab, her Ph.D. student Shahad Alsaiari and colleagues from the University's Advanced Membranes and Porous Materials Center realized that switching to gold nanoparticles could give antimicrobial coatings detection capabilities—these tiny crystals have sensitive optical properties that can be tuned to spot specific biomolecular interactions. But incorporating them safely into polymers required new types of nanofillers. "Nanofillers are small chemical agents distributed in the matrix of a polymer composite," explained Khashab. "They're dopants, so they improve on the regular material and introduce new properties—in our case, making the coating antibacterial." 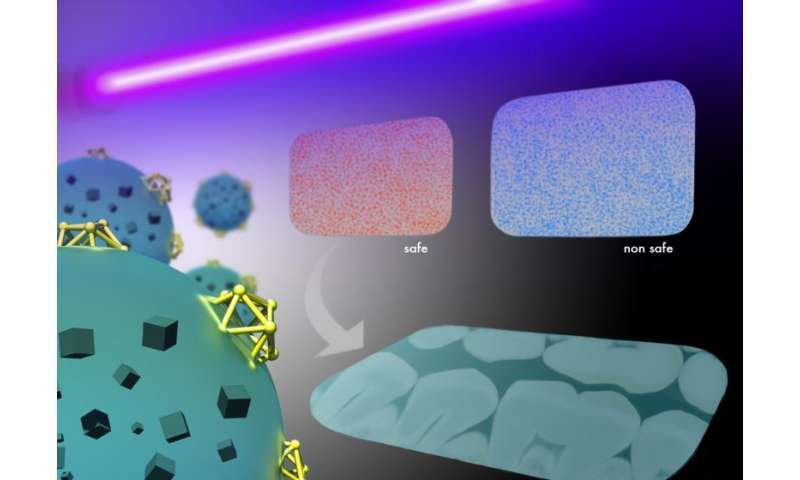 The team's approach uses gold nanoclusters treated with lysozyme enzymes that have innate defenses against pathogens, such as Escherichia coli, commonly known as E. coli. They attached these colloids to the surface of slightly larger, porous silica nanoparticles stuffed with antibiotic drug molecules. "The process of coating is easy," noted Khashab. "We are looking at improving this technology to include other medical devices of different sizes and shapes."